1. Oxygen is still recommended to be given at 100% to the unresponsive patient, but should be titrated down as soon as ROSC (Return of Spontaneous Circulation) to maintain sats > or = 94%. 2. Passive oxygen delivery or hands only Chest Compressions provide expelling air from the lungs and allows recoil of the chest which draws in air or oxygen. While there is promising data to show improvement in the out of hospital setting (utilizing a mask and 100% oxygen while chest compressions are done), the AHA does not recommend removing ventilations for the health care provider. 3. Bag-Mask Ventilations - best utilized with 2 persons and is not recommended for the lone rescuer. Provide an adult bag (1-2 Liters) and utilizing the head-tilt-chin-lift to pull the head into the mask obtaining a good seal deliver about 600 mL of volume or enough to cause chest rise over 1 second. 4. Cricoid Pressure - is NOT recommended for routine use during resuscitation to prevent gastric inflation. This is a change as it has always been recommended in the past. There have been mixed results: helping to stop gastric inflation, but many times impeding ventilation and even intubation. 5. 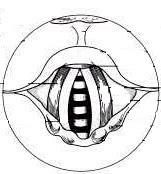 Oropharyngeal Airways - can be helpful in maintaining an open airway in the unresponsive adult with a bag-valve-mask. The concern is that the if semi-conscious or if placed incorrectly, the patient's airway can be occluded by the oropharyngeal airway. 6. Nasopharyngeal Airways - are more helpful in the semi-conscious adult where the oropharyngeal airway cannot be placed to help with a bag-valve-mask to ventilate an arrested patient. The Circulation, part 8, article sites a study done in 1993 that assessed placement of nasopharyngeal airways that says bleeding may occur in as much as 30% of patients. It also reports 2 cases of inadvertent intracranial placement of the airways with patients with basilar skull fractures. Generally speaking, nasopharyngeal airways should not be placed into a patient with a basilar skull fracture, facial fractures, or bleeding disorders. 7. Advanced Airways - were once the gold standard for all arrest patients. There are recent studies that show delayed endotracheal intubation, passive oxygen delivery (O2 with hands only chest compressions) and minimally interrupted chest compressions was associated with improved neurologic survival. A. Supraglotic Airways - There is no evidence that advanced airways improve survival rates in arrest situations out of the hospital setting. Direct visualization of the glottis is not required for these airways and therefore are easier to train and maintain skills in placement of these devices. It has been shown to be as effective as endotracheal intubation and the bag-valve-mask. on successful ventilation at 62-100% in different studies. chords) that should go into the esophagus. on successful ventilation at 85-97% in different studies. It can be used as an alternative to bag-mask ventilation. contact me, I will remove the picture. Endotracheal (ET) tube would cause. placement, some cannot be ventilated. on successful ventilation at 72-97%. the ETtube is more advantangeous than the bag-valve mask. I'll discuss the laryngoscope and process of intubation. *Intubation: ETTube choice depends on the size of the individual. A general rule is to look at the patient's "pinky" finger for the diameter of tube to use. Generally, 7.0-8.0 for a woman and 8.0-9.0 for a man. Check the balloon with a 10 mL syringe by inflating the balloon, while still maintaining sterile in package. Put pressure on the inflated balloon, then deflate by withdrawing the 10 mL of air. Make sure suction is available to suction out the mouth. Then, choose the type of blade to use. opening visualizing the chords directly. Also called a direct intubation. chords (white upside down V like shape). Make sure your bulb is "white, tight, and bright." Many laryngoscopes are now fiberoptic and have no bulb. Older models would still have a bulb that could burn out or become loose and fall into the lungs if not tightened. Change batteries in the handle if needed. Do NOT provide cricoid pressure (Sellick's maneuver) with the thumb and fore finger to the cricoid cartilage (just below the "Adam's apple"). This is no longer recommended. The goal is to place the endotracheal tube (ETT) or another advanced airway in the glotic opening of the Larynx; the balloon is to be just past the vocal chords (1-2cm past). Take no longer than 30 seconds to attempt to intubate. Note: NEVER, EVER, LET GO OF THE TUBE UNTIL IT IS SECURED. Primary confirmation is direct visualization of the tube through the vocal chords and auscultation of the lung sounds, bilaterally and abdominal sounds in the epigastric area. 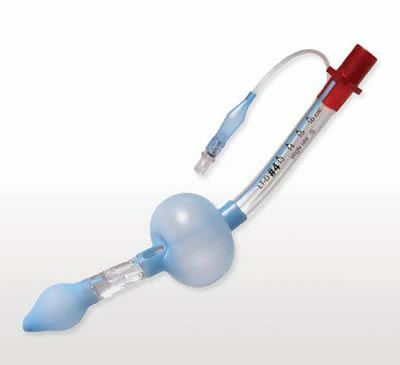 The secondary confirmation should be the continuous waveform capnography as the most reliable method of confirming and monitoring placement of the ET tube, p. S733. End tidal monitoring (Continuous waveform capnography) is recommended, with clinical assessment, as the most reliable method of confirming and monitoring ET tube placement. The end-tidal CO2 detector (bag the patient 6 times at least then place the device on the ETT and it will turn yellow to indicate CO2 if it is in the trachea) can be used as a short term means to confirm placement if waveform monitoring is not available after visualization and auscultation. 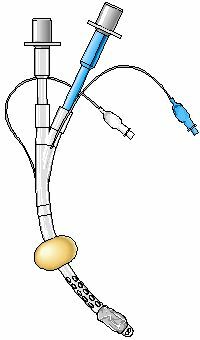 The esophageal detector (squeezing the bulb once attached to the tube and then release - if in the trachea, the idea was that the cartilage around the trachea will allow the bulb to reinflate. But, if it was in the esophasus, it would not reinflate) can be used as a short term means to confirm placement if waveform monitoring is not available after visualization and auscultation. The recommendation is 500-600mL of tidal volume will cause chest rise instead of the previous thought of 700-1000mL, but most importantly visable chest rise, since we wouldn't be measuring the tidal volume.